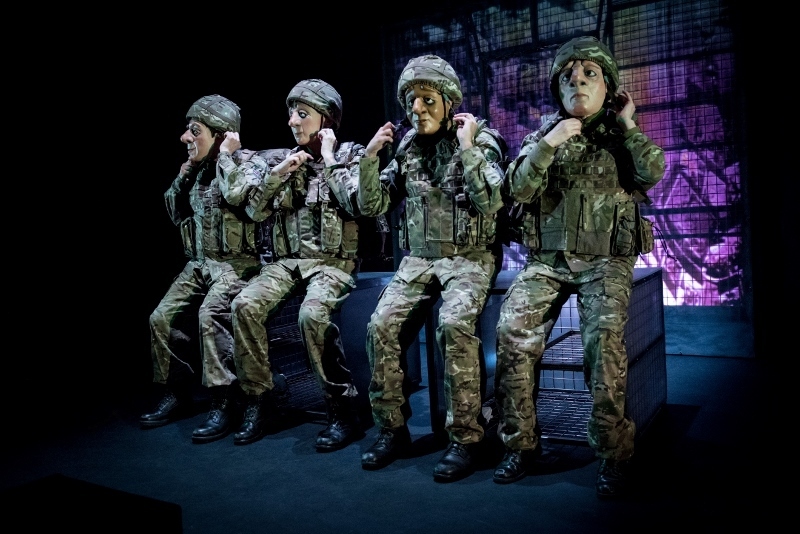 The still largely hidden and unresolved issue of Post Traumatic Stress is effectively and, in some ways, beautifully told in this remarkable production about the subject. 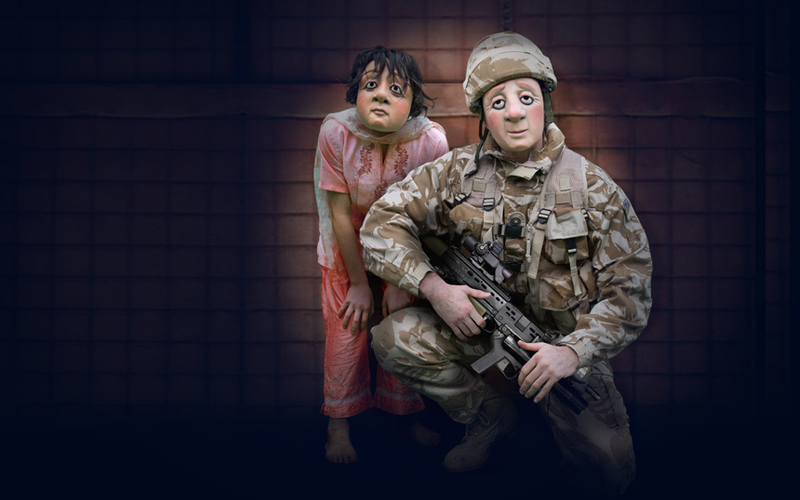 The play, entitled A Brave Face, tells the story of the aftermath of a traumatic incident involving an ordinary young soldier during wartime. But what makes this production by Vamos Theatre remarkable is that the story is told without a single word of dialogue or facial expression, with the amazing cast having to act behind different masks. Writer and Director Rachael Savage, who spent two years researching the subject of post-traumatic stress with the help of former combat soldiers, has produced a powerful piece of work that perfectly captures the subject that clearly lies close to her heart. Soldier Ryan holds a child's doll during a tour of Afghanistan. The fact that the performance is delivered by Vamos, a fully masked theatre company, makes it all the more compelling. It is nothing short of incredible that such strong emotions and feelings can be conveyed without any dialogue, from the packing of presents for a Christmas parcel to the raw and highly charged scene at the end. A Brave Face, which was performed at the Lichfield Garrick theatre on Saturday 30 March as part of a UK tour, tells the story of Ryan who joins the Army in search of adventure, only to find himself deployed to conflict-torn Afghanistan on the eve of his 18th birthday. Once in Afghanistan he meets and befriends a local girl who poignantly reminds him of his own younger sister back home. But then disaster strikes during one ill-fated patrol which leaves Ryan physically injured but also mentally damaged. Back home Ryan is shunted from pillar to post as he tries to access the help he increasingly needs. In scenes that may be painfully all too familiar to real sufferers of PTS or Combat Stress, his deteriorating mental state leads to growing division and conflict with his family. A Brave Face, which is accompanied by an effective, often eerie original soundtrack, is made possible by a superb cast, led by James Greaves as Ryan, Tessa Gaukroger as his mum, and Sophia Knox-Miller as both his sister and the Afghan girl he meets. The cast, who also take on various additional roles, is excellently completed by Brazilian actor Joao Ricardo Aguiar and Joshua Patel as Ryan's fellow soldiers. 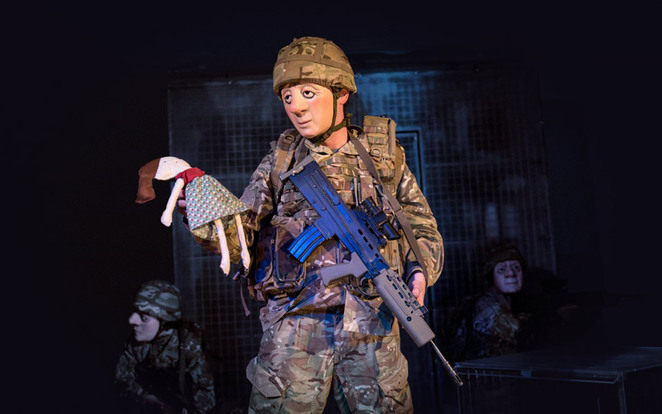 A Brave Face, a co-production with The Mercury Theatre, Colchester, continues its UK tour with dates throughout April.